The past few months have been an education - an education in skincare. Thanks to advanced facialist Caroline Hiron’s blog and Laura Kennedy’s wonderful posts on Beaut.ie, I’ve overhauled my skincare routine. Mineral oil, exfoliating toner and hyaluronic acid are now part of my vocabulary - the latter two also an essential part of my skincare arsenal. Any products containing mineral oil have been dumped. 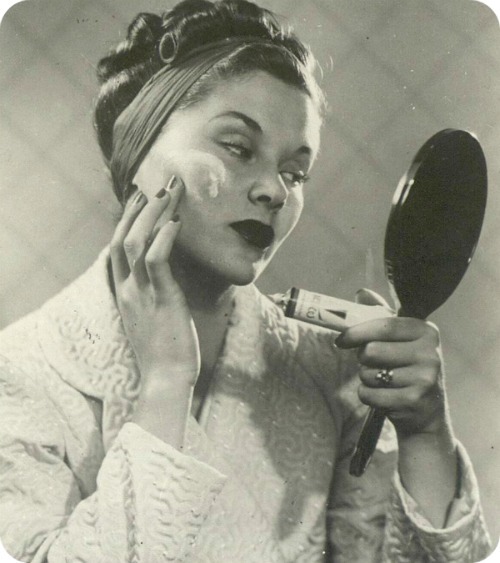 Mineral oil, also known as petrolatum and liquid paraffin, is a controversial ingredient loved and loathed in equal measure. I personally believe it’s comedogenic and has no benefit to the skin. However, I know many people will disagree with me. As well as banishing mineral oil, I’ve also given manual exfoliators the old heave-ho. Manual exfoliators can cause broken capillaries and unfortunately I already have a few of those. In the words of the great Caroline Hirons, “Nothing good ever came from scrubbing your face with a peach kernel. There's a reason they are 99p. Step away.” I now rely on exfoliating toners to remove dead skin cells (more on that below) and with the aid of hyaluronic acid my skin has improved dramatically. I was plagued with dry patches and milia; now I’m dry patch-free (I honestly can’t remember the last time I had one!) and the milia are steadily retreating. Below is my current skincare routine. Eye Makeup Remover: I always remove my eye makeup with a separate cleanser. Sporting an almost permanent cat eye flick demands this. I’m not loyal to any particular brand but I only use bi-phase (oil and water) formulas. These type of formulas instantly dissolve eye makeup when activated (just shake, shake, shake) whilst being gentle and nourishing. They’re also excellent at removing lipstick. I’m currently using Garnier Express 2 in 1 Eye Makeup Remover (€4.29). Cleanser: My cleanser of choice is an oil-based cleanser - Super Facialist By Úna Brennan Vitamin C+ Brighten Skin Renew Cleansing Oil (€13.99). This contains a beautiful blend of lightweight oils including olive, grape seed and rosehip oil. As with all cleansing oils, you massage Super Facialist into dry skin (a little goes a long way) and then add warm water to emulsify and rinse off. I always use a face cloth to ensure my skin is thoroughly cleansed and to gently exfoliate. I adore this product, never before has a cleanser removed my makeup so effectively without stripping my skin. I use this morning and evening but if I get bored and want to mix it up a bit I turn to No7 Beautiful Skin Melting Gel Cleanser, which is another oil-based cleanser. Here are Caroline’s cleansing tips. Toner: Before Clarins Gentle Exfoliating Brightening Toner (€31) I’ve never really bothered with toning. Past experience with toners had led me to believe that they’re astringent liquids that dry out my already parched skin. And the truth is the majority of classic toners are just that - perfumed water with a high alcohol content. However, there’s a new generation of toners about town. Exfoliating toners, also known as acid toners, contain very small amounts of alpha hydroxy acids (AHAs) to encourage cell turnover in the skin and increase the effectiveness of skin care applied afterwards. I was hesitant about buying this Clarins toner not only because of the price (I almost cried handing over that amount of money for one product) but because I’ve very sensitive skin. However, this toner is ultra-gentle and doesn’t dry out my skin. It’s also worth every cent and a bottle will last approximately 2-3 months. A word of warning: AHAs increase your skin’s sensitivity to the sun so you must wear sun protection while using this. Read Laura’s post on why we should all be using toner here. Serum: Hyaluronic acid is the beauty buzzword of the moment. It seems any serum or moisturiser worth its salt now contains this magical ingredient. But what is it? Hyaluronic acid is a molecule that’s found in virtually every part of the body. It’s a powerful hydrating agent capable of holding up to one thousand times its weight in water. When applied topically under a water-based moisturiser, it greatly increases the potency of that product. 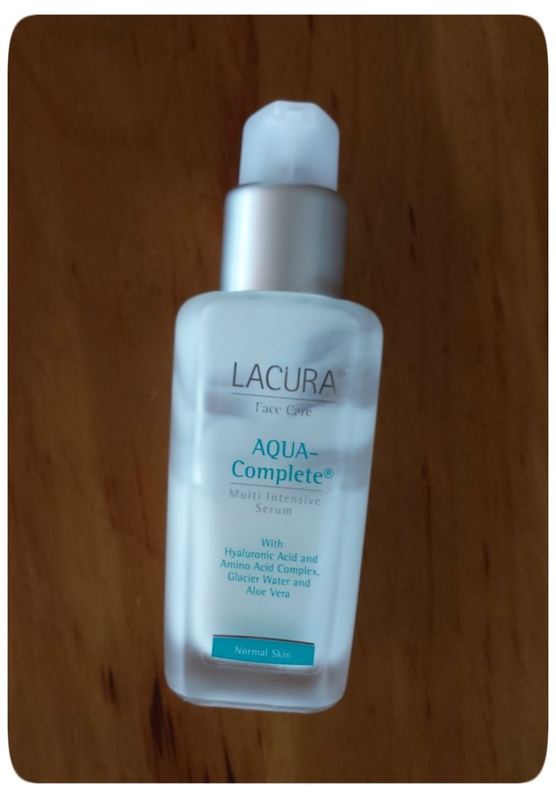 Aldi’s Lacura Aqua-Complete Multi Intensive Serum (€4.79) is the most affordable serum containing hyaluronic acid that I’ve come across. It’s a reported dupe for Vichy Aqualia Thermal Serum and while I can’t confirm this as I’ve never tried Aqualia Thermal, they do have similar ingredients. Lacura Aqua-Complete, aimed at people aged between 20 and 35, is a thin serum that sinks into my skin instantly. I apply this morning and evening and one pump is enough to cover my face and neck. As this is quite a perfumed product I was convinced I’d react to it but my skin adores it, it literally drinks it up. Day Cream: Wearing a high SPF has been a crucial part of my daily skincare routine for years. 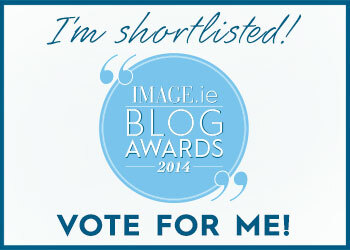 I’m still using and loving Simple Kind To Skin Protecting Moisture Cream SPF 30 (€5.29) which I wrote about here in February. Night Cream: I picked up Simple Kind To Skin Vital Vitamin Night Cream (€6.99) a few weeks ago and while I like it, I don’t think I’ll repurchase it. It’s a lovely lightweight cream packed full of vitamins including pro-vitamin B5, vitamin E and vitamin F. However, it’s a little too light for me and I think it would be best suited to combination skin. 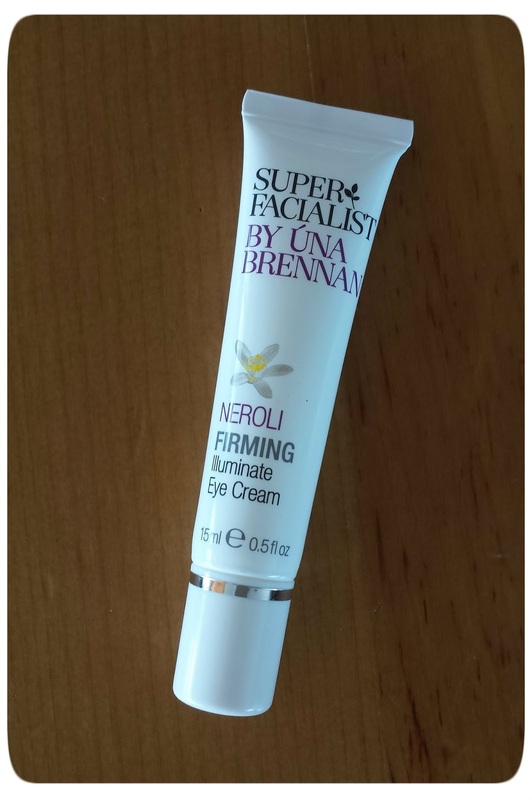 Eye Cream: Super Facialist By Úna Brennan Neroli Firming Illuminate Eye Cream (€14.49) contains the wonder ingredient hyaluronic acid as well as shea butter, grape seed oil, aloe vera and caffeine. This cream has a very fluid consistency but hydrates the eye contour very well. Online reviews praise this product for its de-puffing abilities but I can’t vouch for that as thankfully I don’t suffer from puffy eyes. I’ve been using this for the past 8 weeks and while I haven’t noticed any difference to my fine lines, I'm really liking it. 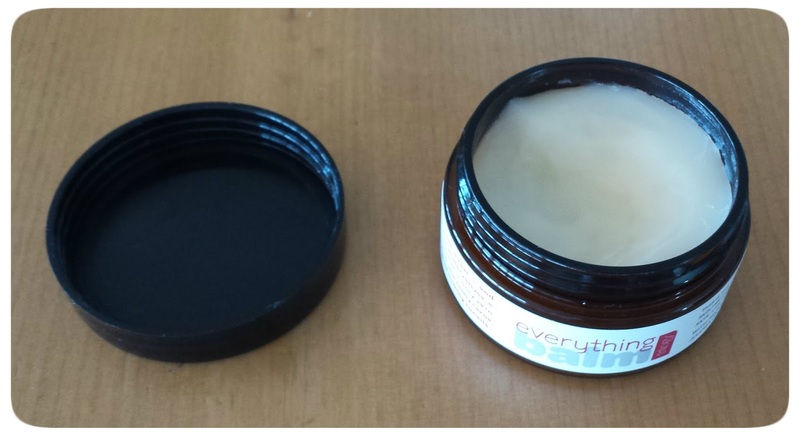 Multi-Tasker: Everyone should have a multi-tasker in their skincare arsenal; mine is Trilogy Everything Balm. There is only one tiny tiny advantage to my twin sister living in New Zealand and that’s the beautiful Trilogy products she sends me (I recently got The Rosehip Collection travel set - gorgeous!). This balm smells heavenly and is full of natural ingredients including sweet almond oil, beeswax, evening primrose oil, rosehip oil and honey. It’s quite solid; you need to warm it between your fingers before using but once melted it sinks in quickly. I use this on my cuticles, as a lip balm and on any rough areas - elbows, knees and feet. I’ve also used it as a face mask/treatment, leaving it on my face for approximately 15 minutes and removing it with a warm face cloth. What’s your current skincare routine? Thanks Trish! The Clarins toner would normally be out of my budget but it is worth the extra few bob. Super Facialist By Úna Brennan is an excellent mid-priced range. 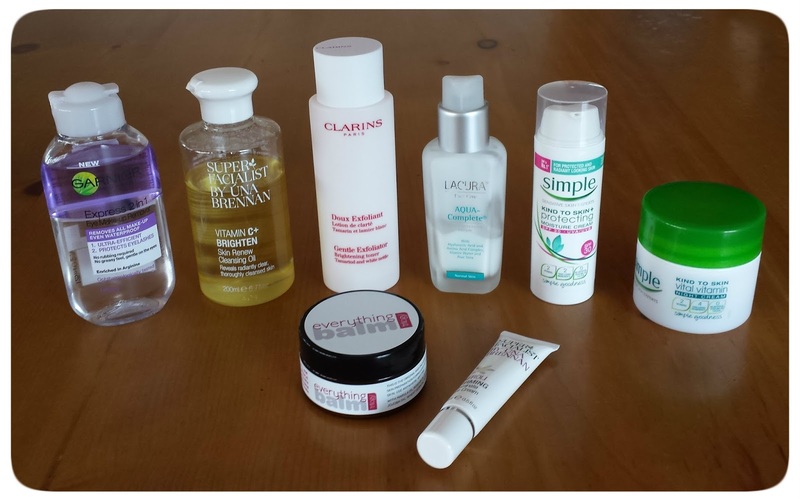 Those beauty products seem great, Eimear! They all have the ingredients that help nourish the skin. But I think the most important product every beauty enthusiast should have is a skin moisturizer. Not only does it condition your skin, but it keeps your skin from overproducing oil as well, especially when the temperature is cold.